I am currently running 10.5.8 Leopard and using Microsoft Entourage for my Mail. I have an iPod Touch and am having difficulty syncing Entourage.I wish to eliminate Entourage and go to Mail for my mail service. My ISP is Westnet with which I am more than happy.I am a relative newcomer to computers and seek directions to achieve the above. I am Sr. Mac Tech Support Specialist, Terry, glad to assist you. • In your question, when you mentioned eliminating Entourage, are you referring to wanting to remove it to the Trash, or simply stop using your Westnet email account in that application and begin using Mac OS X 10.5.8 Leopard's built in Mac OS X Mail application. Do I have this correct? Thanks, XXXXX XXXXX be looking forward to your reply. Thank you! Glad to be of assistance Dennis. The only way to remove Entourage altogether is to go into the Applications folder, locate the Microsoft Office for Mac folder and remove the Entourage icon from that folder and also remove the Entourage icon from the Dock, if the icon is there as well. This is the easiest way, without removing the entire Office for Mac suite. • Now within the accounts window, select the "+" icon located toward the bottom of the Accounts window. This will activate the New Account setup assistant. through the next few screens. 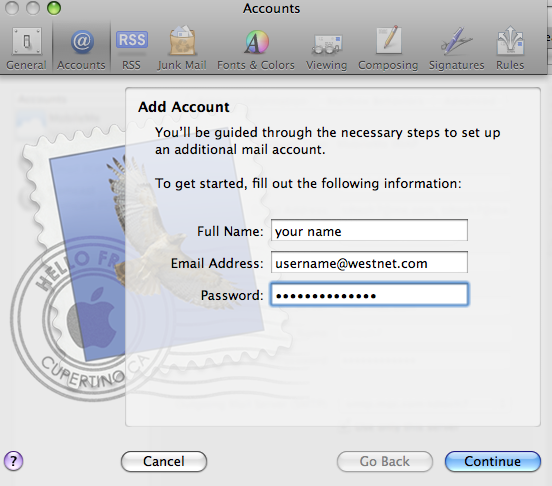 Once you have done that, you will have a final summary indicating that you have entered your information in correctly and your email account will now be added to the Mac OS X Mail client. From here you should be able to receive and send emails from the WestNet email servers. Let me know if this helps. If you have more questions please feel free to reply back to this post and I will be glad to assist you as much as I am able. I have Mac OSX 10.5.8 and Entourage Version 11.4.0 (2004).